Development of cities, the renewal of residential and older industrial neighbourhoods, together with issues of race, polarisation and inequality has remained at the forefront of policy and academic enquiry across Europe and North America. This book offers a forum for informed debate on critical themes from the role of the state, to displacement of communities. The processes of privatisation, deregulation and the changing structure of cities with the decline of manufacturing industry are moving the agenda on, revealing complex and deep–seated problems which need needing practical and radical solutions. 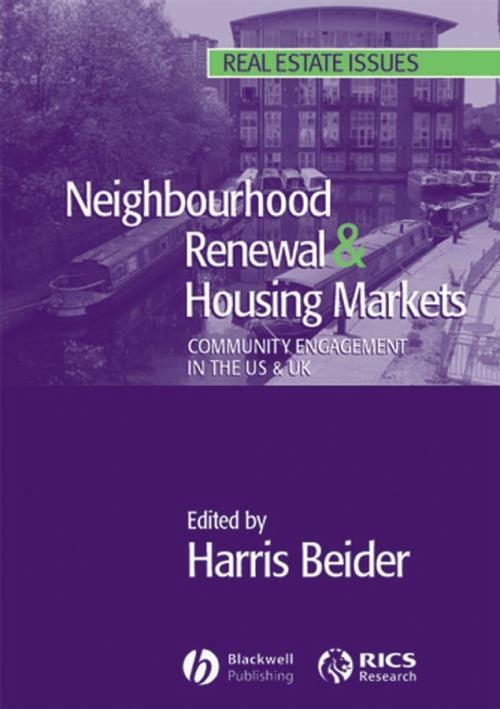 Neighbourhood Renewal & Housing Markets: community engagement in the US & UK provides an important new contribution to these debates and highlights specific issues and developments crucial to an understanding of residence, renewal and community empowerment in the UK and the US. The book presents original research material related to both countries, a discussion of the transferability of experience between these and a discussion of the issues emerging from the consideration of the two in parallel. The book is grouped into four sections: Policy and Demographic Change; Changing Cities and Neighbourhoods; Institutions and Change Agents; and Conflict, Participation and Power. With contributors from both sides of the Atlantic, the book reflects the interests both of the academic research community and policy communities. Robust and research based, the material also directly engages with issues around policy and delivery. 2. A United Kingdom? Changing Spatial, Ethnic and Tenure Patterns in England. 3. More Pluribus, Less Unum? The Changing Geography of Race and Opportunity. 4. Reflecting on New York City s Housing Policy: 1987–2004. 5. Changing Housing Markets, Race and Community: Policy and Practice in Birmingham. 6. Race and Public Housing transformation in the United States. 7. Living Parallel Lives? Housing, Residential Segregation and Community Cohesion in England. 8. Resistance and Change: Political and Community Mobilisation in Harlem. 9. The Transformation of English Housing Associations: Responding to Change. 10. The Fall (and Rise) of Community Development Corporations and Black and Minority Ethnic Housing Associations. 11. Housing, Regeneration and Change in the UK: Estate Regeneration in Tower Hamlets, East London. 12. Erasing the Community in Order to Save it? Reconstruction Community and Property in Community Development. 13. Communities, Networks and Power: Is there a Localisation of Decision–Making.